John Connor: I knew it was coming but this is not the future my mother warned me about. The TERMINATOR series has always had large gaps between installments. The first installment debuted to modest results in 1984; the second followed in 1991 and crossed over to the mainstream thanks to James Cameron’s patient and human approach to the action blockbuster. The third film came out in 2003 and essentially killed the series. Many thought that would be the end but McG, a director with a spotted history at best, recently resurrected the franchise. McG believed that there was more to this story to tell and new ways to tell it. 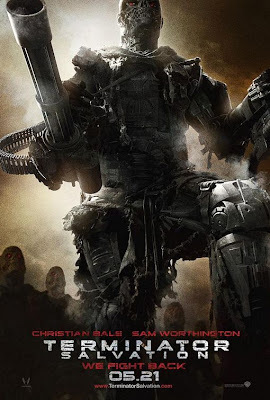 As far as I can tell after having seen TERMINATOR SALVATION, he was pretty much wrong on both fronts. The story is just more of the same and, while the visual style and setting are certainly new, they are heavily borrowed from the gaming realm so I’m not sure they can be called new in the original sense of the word. 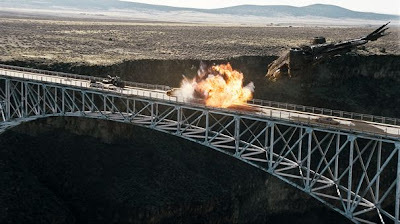 McG makes films that either go big or go home. This one certainly went big but it did so with its bags packed and ready to go home at any moment. This is the first in the series to take place in the future, 2018 to be precise. Every previous installment has taken place in present day and played with time and space. Terminators and power players from the resistance have gone back and forth in time to make sure that certain events either do or don’t take place so that certain other events in the future either do or don’t take place. TERMINATOR SALVATION is no different. 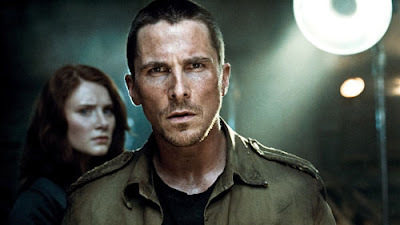 John Connor (Christian Bale, who often seems to have forgotten that he isn’t playing Batman this time) is the leader of the resistance. The resistance is a small group of human beings who were fortunate enough to survive Judgment Day but, as a result of their survival, then had to fight the machines in order to maintain their survival. The machines orchestrated Judgment Day as a means to wipe out humanity and rule the planet. Humanity created the machines to begin with. 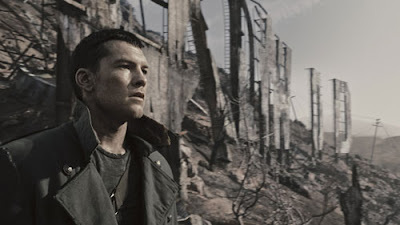 It isn’t a terribly complicated plot after you go over it a couple of times in your head but TERMINATOR SALVATION does very little to advance that plot, which begs to question why it was even made. As far as I can tell, it was made to indulge a need to see the war that was always only alluded to in the previous films. Stylistically, McG has crafted a dank and dismal post-apocalyptic planet. For a film about salvation, there doesn’t seem to be much left to salvage. The land is barren and there is destruction everywhere you look. And while there isn’t much new to absorb from a plot perspective, there is still plenty to enjoy in terms of action. The Terminators have only one purpose – to kill or capture any human they come in contact with – and they never sway from that purpose. They are relentless and have no fear so their threat is always very real and constantly frightening. As it takes so much to kill them, it never feels as though humanity’s mission will be realized. That said, it is quite clear that McG spent a great deal of time preparing for this film by locking himself in his basement with his Xbox. Many sequences seem like they have taken perspectives I have seen in many a war game (inevitably being played by someone else as I only observe instead of play games). His technical approach shuns the organic and almost makes it seem as though he is rooting for the machines. TERMINATOR SALVATION is the first in a new trilogy of Terminator films. Its bleak tone will ensure that it doesn’t cross over the way T2 JUDGMENT DAY did. It simply isn’t that accessible. You need to know the history to understand the plot properly but as the plot is second to the action, it can still be greatly enjoyed by appreciating just this aspect. If McG wanted to redefine the series, he didn’t have to look any further than this film’s newest character, Marcus Wright (Sam Worthington). Half machine, half human, Marcus asserts his humanity with his live, beating heart found beneath his metallic frame. McG focused too heavily on the frame and forgot what keeps everything alive. I agree that Worthing was excellent. He was very engaging, the perfect embodiment of robotic emotion. Bale was just robotic. He had two functions: Yell and Snarl … He should see a dialect coach at this point or they may end up needing to subtitle the next Batman movie just so we can understand him.